This Was Not The End I Was Talking About Either! In a recent blog, I posed the question; “when is the end not the end?” I was referring to my commitment to continue writing, and observing through my website ZD45. Well, combining observations with News Stories We Missed, “The End,” as in death, has been in the news a lot lately. This post has nothing to do with Robin Williams (the way he lived; making people laugh supersedes the way he died). No, what I’m really talking about is the misconduct of Funeral Directors and other related news we don’t often talk about. Funeral Directors are people, and the funeral business is just that; business. If we accept this statement, then it should come as no surprise that as with the rest of the world, people, and businesses sometimes go astray. This is nothing new. There have been plenty of stories in the news over the years of mismanagement in the funeral business that encompass incompetence, questionable ethics, and flat-out criminal activity. For most humans, death is not an easy subject to deal with because it’s generally surrounded by sorrow, grief, and the struggle to move on without people we knew and loved. We hope to heal, but what happens when the past comes back to us concerning “those we thought had moved on?” So was the case this month when several stories appeared concerning the past. First, funeral director, Alfred Pennine committed suicide in New Hampshire recently. Another funeral director brought Pennine’s body to his own funeral home in Rhode Island. When he got there, he discovered the cremated remains of 45 people in the basement, and several bodies found out back in the garage. This obviously led to a police investigation, which led to more bodies being found in a rented storage facility. The police suspect that the bodies were illegally cremated, and the fees for the service were kept for financial gain. The police also say the investigation is continuing, and the scope is increasing. In an odd and morbidly humorous note, a recent video produced for a local news station segment showed the entrance to the funeral home at the center of the investigation. The video ends by zooming in on, and holding the picture of the front window displaying a plastic health department decal that says “it is illegal to smoke in this establishment.” Good to know Pennine was following all health codes; sort of. At least we can respect the camera man’s keen eye for observation. In 1948, British author Evelyn Waugh was visiting Los Angeles to negotiate movie rights to a book he had written. While there, he was educated on the L.A. funeral business which he found so outrageous and absurd, that he penned another comic novel called The Loved One; An Anglo-American Tragedy. I came across the novel a few years ago, buried in a bookshelf on my good friend Comrade Baris’s boat. It was quite the wild and amusing read. In 1965, the general basis of the book was used along with another true life expose called the American Way of Death by Jessica Mitford detailing the abuses of the funeral industry. 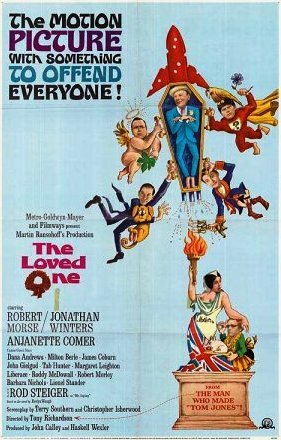 Both stories were combined into a Hollywood movie called “The Loved One.” When the film was released, the movie poster bill labeled the movie as “The Motion Picture With Something to Offend Everyone. “ I never saw the movie, but the fact that it has Jonathan Winters in it merits watching. One New Year’s Day afternoon, Comrade Baris and I came across one of Comrade’s old friend, Helen. Comrade knew her in the “old days” as a manager at the lumber yard. Now? She was a full- fledged, card-caring member of the funeral directors. That afternoon, Helen told us many tales. Months later, she wouldn’t speak to us; not because she had revealed top state secrets, but because Comrade failed to procure tickets to the traveling Broadway show of “Joseph and the Amazing Technicolor Dreamcoat,” and invite Helen out………whoops. The End…….and I mean it this time!